My sister made banana bread yesterday, which was great because I have been craving banana bread for quite a while (especially after seeing it on so many menus in Sydney! ), although I did have it once on my trip. What wasn't so great, though, is that she used up all the all-purpose flour that we have left in the house. 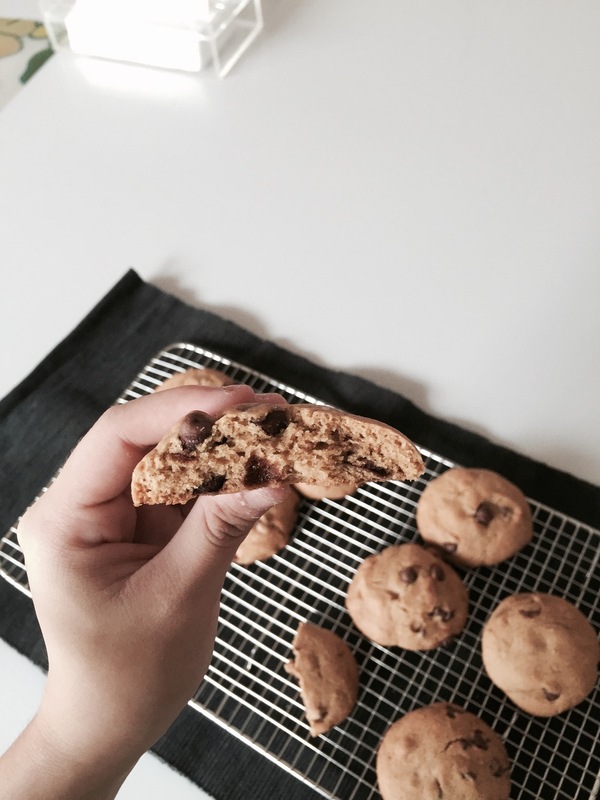 And I wanted to bake Sally's salted-caramel stuffed chocolate chip cookies, especially after finding rolos in Australia! I don't think we have these in Singapore, so I was rather excited. Thankfully, I discovered a new pack of bread flour in the kitchen cabinet and a quick google search showed that Alton Brown's The Chewy recipe called for bread flour over all-purpose flour! These cookies are my new favourite cookie. I'm so happy with how they turned out! They are incredibly close to being my ultimate chocolate-chip-cookie, but I feel that this experience had been somewhat affected by the addition of the rolo to give it that salted-caramel inside. They made the cookie too thick, and unnecessarily messy. My sister suggested that I add half a rolo instead of the whole thing next time, which is a great idea. The whole rolo in the cookie tasted great, though. Haha I'm really happy with these in general! Once again, I took it a step further and browned the butter. I swear I'm absolutely hooked on brown butter. It's so magical. I feel like once you've got the hang of it, you simply can't stop. Also, this time, I decided to exercise patience and chilled the dough for an hour before baking. I'm not very sure how much of an impact it made - next time I think I shall make one batch without chilling and another with, and compare them from there. I'm in a bit of a baking mood after watching seven episodes of the Great British Bake-Off on the flight back, and quite a number of Masterchef episodes while in Sydney. Yesterday, I went down to the library to borrow six cookbooks to browse through, and I can't wait to try out some of the recipes! With about two months of freedom left, I really want to make the best of my time doing what I love. ALSO, after a lot of pondering I've decided to move my site to squarespace! I really love the clean, minimalistic layout I can have with my blog, and I like how the images automatically fill up the width of the page. It was a peeve of mine back with wordpress. I'm quite happy with this investment I've made! *this odd measurement came about as i halved the original recipe. to get half an egg + half an egg yolk, simply crack one egg and one yolk into a bowl, beat it together and pour about half of it into another bowl. Brown the butter in a saucepan over medium heat. Let it cool while you prepare the rest of the ingredients. Whisk together the flour, baking soda and salt. Whisk together the eggs, milk and vanilla. Whisk the sugars into the butter, followed by the egg mixture. Gently fold the flour mixture into the butter mixture, leaving visible streaks of flour before you pour the chocolate chips in. Mix everything until just combined. This is the part where you exercise patience! Chill the dough for an hour. Preheat your oven to 190 degrees celsius. Line your baking tray with baking paper. Weigh out approximately 50g of rolo plus cookie dough. Then, divide the cookie dough in half, and sandwich the rolo in between. 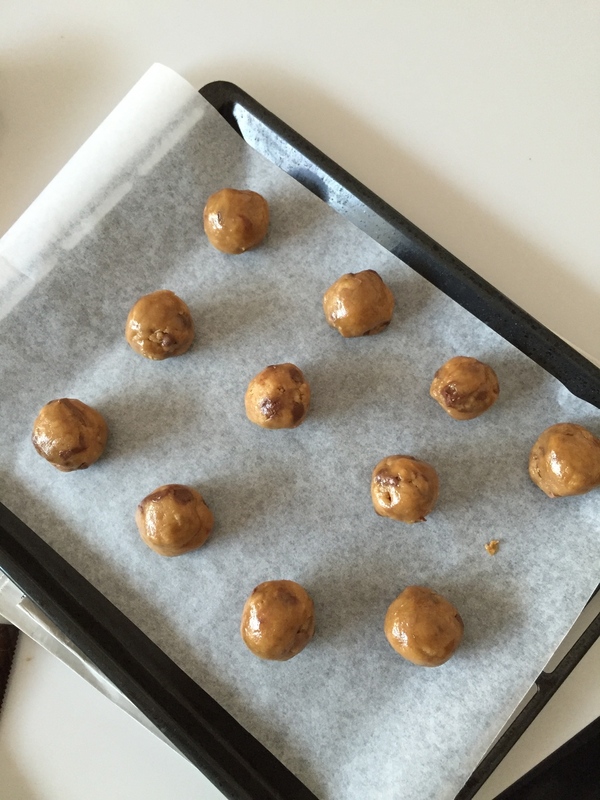 Seal the edges by pressing the cookie dough around the rolo with your fingers, and roughly roll it into a ball. Bake for about 15 minutes, let it cool, and enjoy! Life is full of hits and misses and sometimes, you have to take a shot in the dark. And you never really know how those turn out. It's a lot of risk-taking and finger-crossing and internal prayer-saying - and if you're lucky, you get a hit. Hopefully in your life you have more hits than misses, but if anything, I'd hope the hits are always worth the misses. I had a hit today!! Oh, happy day. I had initially planned to go for a run at 730 and then come home, make some pancakes and do some work. But how often do plans turn out the way you want them to, anyway. I woke up at 10 and went out for coffee with my mommy instead, at Dutch Colony - a favourite haunt of ours. I love our morning coffee runs, and a jolt of caffeine is one of my favourite ways to kickstart the day. Gets my mind going, brain cells working. A buzz of energy. Also, time spent with mommy is always time well-spent. Good mornings, indeed. By the time I got back, it was time for brunch... Lunch... Whatever. I'm sitting at the dining table typing this out as my parents are eating their lunch (traditional "popiah") and eating... Pancakes. Pancakes all day, everyday, no? In a large bowl, combine the flour, sugar and baking powder. Mash the banana in a small bowl. In a measuring cup, measure out your buttermilk, pour in the egg, vanilla extract and banana. Whisk it all together. Add the buttermilk mixture and the melted butter to the dry ingredients, fold in until just combined. The batter will be thick, lumpy and slightly wet. It's ok.
Heat your griddle over a low-medium heat, and melt a pad of butter over it. Ladle your pancake batter onto the griddle, and cook for about 2-3 minutes on each side, until golden brown. Depending on the size of your griddle, you can cook more than one at a time. Efficiency! Top with sliced bananas, maple syrup, whatever else your heart desires. I added some granola for a bit of crunch. P.P.S I just watched Taylor Swift's Bad Blood music video, and I am in LOVE.